I’m feeling a certain kind of way, and it’s only midweek! It’s tough being black at the moment. First, the Supreme Court’s punting on Affirmative Action on Monday (a policy that helped me access college, a PhD program, and my current academic position), then the Trayvon Martin trial started (and I’m getting emotional so early – y’all, I can’t! ), and yesterday, the weakening of the Voting Rights Act, fought so hard for back in 1965 (check out above video). I’m telling you: I’m feeling a new Reconstruction era/New Jim Crow coming on – it can only happen if we continue to forget our history! My main fear is not folks trying to set us back legally and otherwise, it’s: Do we in 2013 have the same courage as the Civil Rights generation to rise up and fight injustice? Those people were prepared to die for freedom. I once asked my students if there was anything they were prepared to die for. No, was the collective answer. Of course, all is not lost: in gender politics, Texas state senator Wendy Davis gave an 11-hour filibuster that blocked a law banning abortions in Texas. She trended last night on twitter: #standwithWendy. But the racial fallout might make these gender politics mute if we don’t protect the basic rights that are the cornerstone of democracy. One of the social media things I miss from David has got to be his blogs. Granted, he didn’t do these as much once he switched to Twitter and his occasional vlogs. Hoping his kids are coping (poor Paris!). My hope for David: to reach out to collaborators, despite his shyness, and have a vision for his songs (down to the music videos he wants for them). Is it just me, or is David’s Twitter rather sporadic this year? I figured it would be difficult to keep that going for a two-year absence, but what creative ways and what plans do you think should have been in place? 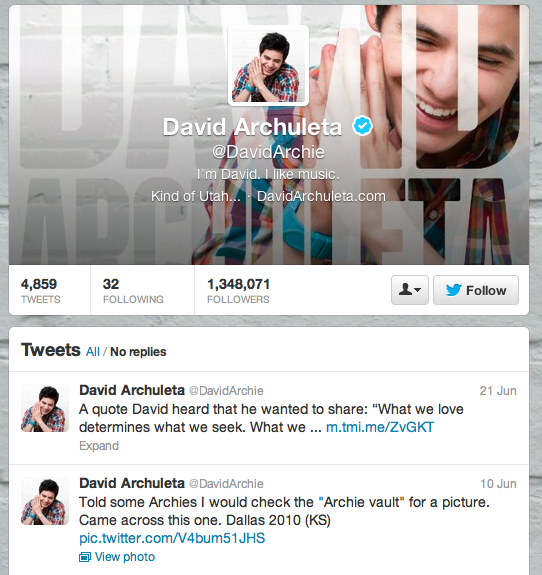 How would you try to manage David’s Twitter? Or would you focus on something else?